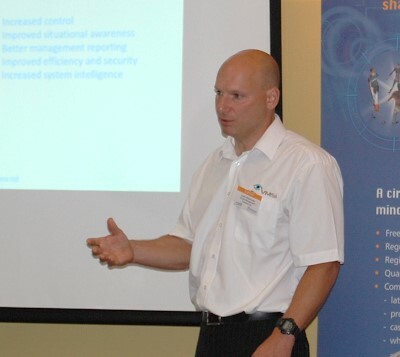 Adam Moorhouse Regional Sales Manager presented the concept of TITAM VISION PSIM solution to an eager audience at the recent IP-in-Action LIVE event at the Holiday Inn Portsmouth, part of a series of educational and promotional road show events across the UK. Adam Moorhouse Regional Sales Manager at Visual Management Systems Ltd., developers of TITAN VISION PSIM and 'Command and Control' Solutions. Adam also demonstrated TITAN VISION, the next generation of security management technology illustrating how offering PSIM solutions to an existing client can provide customer loyalty and future profitability.